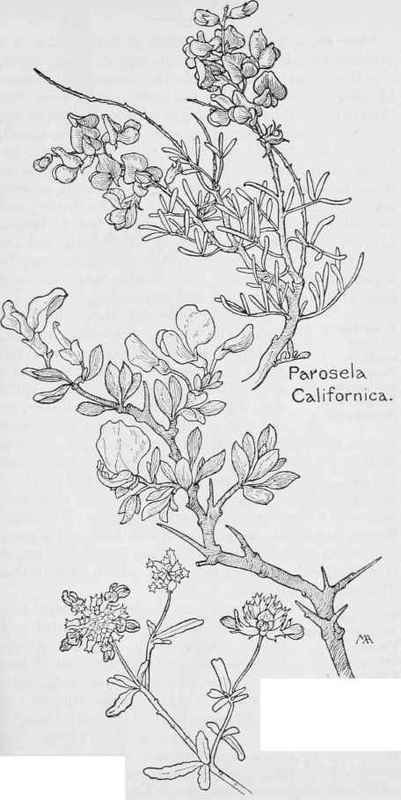 This is the only kind, an evergreen shrub, flourishing on dry hills in the Coast Ranges, with tough, crooked branches and stout spines, forming chaparral so dense that it is impossible to penetrate. It grows from three to eight feet high, the gnarled, knotty, black branches terminating in long spines, which are often clothed with small leaves nearly to the end, the leaves with one to three, small leaflets and without stipules. The bush is often covered with quantities of pretty, bright, deep purplish-pink flowers, three-quarters of an inch long, forming a fine mass of color. The calyx has four, short, broad teeth; the petals are equal, the standard roundish, with the sides turned back and a paler spot at base, the wings oblong, the keel straight; the filaments of the ten stamens not united; the pod is two inches long, flat, straight, sickle-shaped when young. This very rarely produces fruit. Stevenson was probably describing this shrub when he wrote, "Even the low thorny chaparral was thick with pea-like blossoms." Paroseta Emoryi Chaparral Pea Xylothermia montana. PEA FAMILY. Fabaceae. There are so many western kinds of Lupinus that?t is hopeless for the amateur to distinguish them; herbs, sometimes shrubs; leaves palmately-compound, stipules adhering to the base of the leaf-stalk, leaflets, more than three in number, usually closing at mid-day; flowers showy, in terminal racemes; calyx deeply toothed, two-lipped; standard broad, the edges rolling back, wings lightly adhering above, enclosing the incurved, pointed keel, sometimes beaked; style incurved, stigma bearded; stamens united by their filaments, alternate anthers shorter; pod two-valved, leathery, flat, oblong; seeds two to twelve. Lupines always have palmately-divided leaves, and are never trailing, twining, or tendril-bearing and thus may be superficially distinguished from Vetches and Peas, and from Thermopsis, by the united stamens.